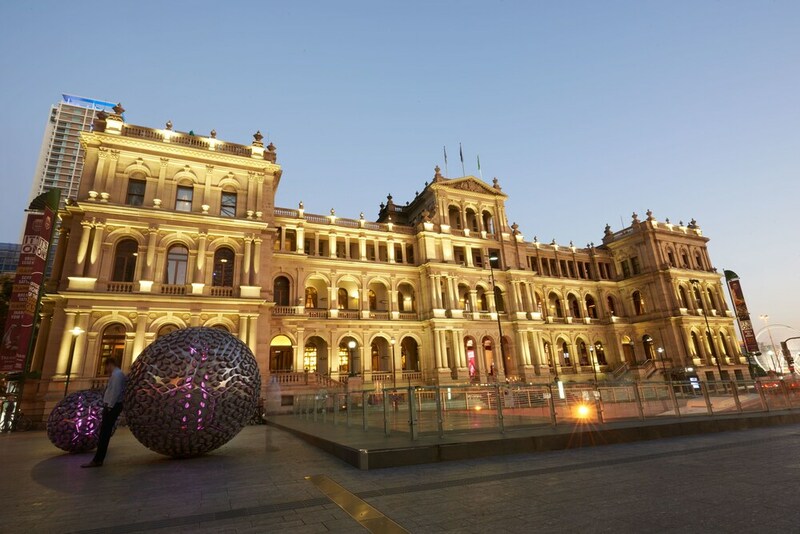 With a stay at Treasury Brisbane, you'll be centrally located in Brisbane, steps from Treasury Casino and within a 5-minute walk of Commissariat Store Museum. This 5-star hotel is 0.3 mi (0.4 km) from Queen Street Mall and 0.3 mi (0.6 km) from Museum of Brisbane. Make yourself at home in one of the 125 air-conditioned rooms featuring refrigerators and iPod docking stations. Your pillowtop bed comes with premium bedding. Wired and wireless Internet access is complimentary, and LCD televisions with cable programming provide entertainment. Private bathrooms with showers feature complimentary toiletries and hair dryers. Try your luck at the casino and enjoy other recreational amenities, which include a fitness center. Additional amenities at this Baroque hotel include complimentary wireless Internet access, concierge services, and babysitting/childcare (surcharge). Grab a bite at Kitchen at Treasury, one of the hotel's 4 restaurants, or stay in and take advantage of the 24-hour room service. Snacks are also available at the coffee shop/café. Need to unwind? Take a break with a tasty beverage at one of the 4 bars/lounges. Cooked-to-order breakfasts are available daily for a fee. Featured amenities include complimentary wired Internet access, a business center, and limo/town car service. Planning an event in Brisbane? This hotel has facilities measuring 7984 square feet (742 square meters), including conference space. Self parking (subject to charges) is available onsite. Dining is available at one of the hotel's 4 restaurants and guests can grab coffee at the coffee shop/café. The property also has a snack bar/deli. Guests can unwind with a drink at one of the hotel's 4 bars/lounges. Business-related amenities at this 5-star property consist of a business center and limo/town car service. Wired and wireless Internet access is complimentary. Event facilities measuring 7984 square feet (742 square meters) include conference space. This Baroque hotel also offers a casino, a fitness center, and tour/ticket assistance. Parking is available onsite for a surcharge. Treasury Brisbane has designated areas for smoking.